Commas and semi-colons are common place in English writing. If a piece of text you were reading had no commas or semi-colons, you would struggle to understand what you were reading. There are however, certain rules and regulations where commas and semi-colons are concerned; some of which, we will go through here. Commas are used inside of sentences, and they are basically used as a pause in the text. Commas have no actual meaning; however, they help add structure to a sentence, therefore add meaning to the sentence. You would use a comma when creating a list or a series of events, or objects. When you come to the end of the list and the last two objects in it, a comma doesn’t normally need to separate them. Instead, you would add the word ‘and’ between them. But, if the two final items are long, a comma may be beneficial. I need to buy tea, coffee, toilet paper, sugar, eggs, milk, butter and salt. My favourite animals are lions, tigers, cats, dogs, elephants and hyenas. Jackson wore his new cap, black jeans, white trainers, and his brand new black and white shirt. When you are creating a list of adjectives or even adverbs, you will need to use commas to separate them. I like the antique, brown, wooden chair. I think I am going to buy the green, new, open-top car. She crept silently, stealthily and quickly. If only using two adjectives you could use a comma where you might otherwise put ‘and’. I loved it because it was a short, simple piece. My dog is a big, black one. In English, numbers after 999 are separated using commas. Commas separate the numbers, whereas periods (full stops) separate the decimals. Generally speaking, commas are used when writing addresses, titles following a name and some dates. Direct speech is different to reported speech. When using reported speech, you won’t need to use a comma. Direct speech includes phrase such as “he said”, “she said” and so on. When using an introductory element to your writing, you will need to add a comma before adding your next point. As the year came swiftly to an end, she realised how quick time flies. During the speech at the university, he fell asleep. Commas are usually used when combining two sentences into one. For shorter, well balanced sentences, using a comma is optional. However, it may bring a little more structure to your writing. Adjoining words such as "and, but, however and so", usually require a comma in front of them. Semi-colons are thought of as ‘soft’ full stops. They join two related sentences together. Using semi-colons instead of full stops can allow the reader to see that the two ideas are connected in meaning. All I can say is you did your best; now, we have to wait for the results. Richard prefers tea; Sarah prefers coffee. Samuel wants to stay in; Isabelle wants to go out. Commas and semi-colons are an essential part of the English language. Without them, we wouldn’t be able to read, write or speak fluently. There are a lot of people who struggle with the rules associated with commas and semi-colons. 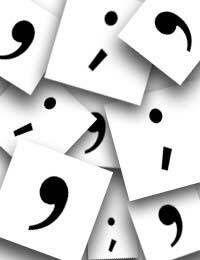 With a little practice, everyone could be putting commas and semi-colons in the right place.